We're inviting you to a strategic gathering to help prepare you for what is on the horizon! We are on the verge of a worldwide move of God, a global harvest of unparalleled dimensions. It's a new era where everything and everyone is challenging our past paradigms, mindsets, and beliefs about the Church as well as our personal experience. And they should be because we in the Western Church are failing to make a difference. There have never been such wars and rumors of wars, silly conflicts over nonessential differences, divisions, accusations, ethnicity, politics and ad infinitum. There's a persistent uneasiness even misery not always clearly definable. People are dropping out of church. Some are writing the millennial generation off. In the heart of this dis-ease I can hear the drumbeat, the rumble of something that is crescendoing almost into a roar. It's a cry, almost a scream for change. Before God fully releases a new thing, people experience marked discontent with things as they are. That discontent sparks the search for something new, fresh. I believe it's a cry for a release of a fresh glory move. We are on the verge of not only the greatest global harvest but a massive tsunami of glory is about to hit the Church propelling it in to a brand new place. A new wave of revival, fresh life, vision, love, and renewed hearts for God first and foremost. A restoration of the awe of and fear of the Lord. With this in mind, we've asked John and Carol Arnott to come. Infused with the Father's heart, tell us the stories of the past revival, the Toronto Blessing. John is a father, Carol a mother. Come tell us the stories that set hearts on fire, transformed hearts and lives, released new mandates and advanced the move of God throughout all the world. We need to hear the stories of glory to fully wet our appetites for what God is about to do. Set our hearts on Fire. And we need to hear the zeal of the new breed arising whose cry is, "the zeal of my Father's House has eaten me up." They are raw, daring, controversial, riders of the edge! They carry the seed for the next step in the restoration of God's heart and House. Ryan LeStrange is one of those firebrands coming to stir as well as shake us up. We need you, your heart, your anointing to come and mingle with us to help catalyze this next massive move of God! 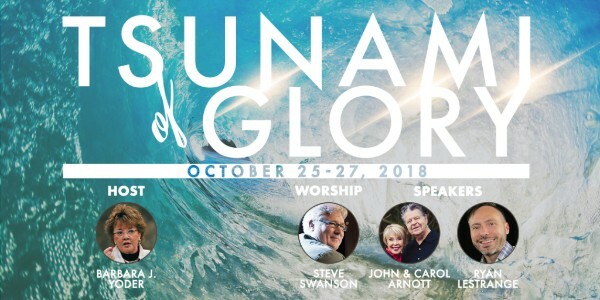 to the TSUNAMI of GLORY conference!